GEFONT and ANTUF Unity Coordination Committee has organised Leading Activist Training Programme in Kathmandu. 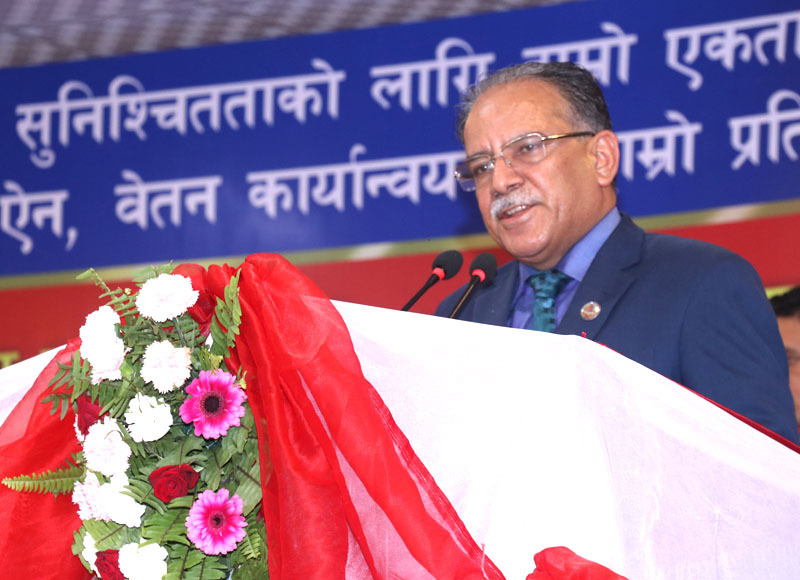 Speaking in the Programme, Nepal Communist Party (NCP) Chairman and Former Prime Minister Puspa Kamal Dahal- Prachanda said that “two major communists parties are united as unity accelerate the power.” He recalled history that major transformations were possible through dialogue and mutual agreement, likewise two Communist Parties are in process of merger at the moment. He further informed merger process of local wings and sister organisations of both parties. NCP Chairman Prachanda added “The opposition party, who was in the government for long time, is against the left parties’ alliance and two-thirds majority in parliament.” Therefore, he aware everyone to be alert against the conspiracy to split the unity among the two communist parties. He also informed about the government crucial agreement between India and China, some of which have been visible now. He quoted that “The Communist Movement is strong in the Country, where there is strong Workers Organisations and the foundation of the Communist Government in Nepal is workers’ organisation.” He emphasised that unity process of two communist parties is fundamental and expected to complete soon.